Place the sweet potatoes on a baking pan and bake them for 45 to 60 minutes till they turn tender. While baking the sweet potatoes, bake the jalapeno pepper along for 20 minutes, till the skin loosens. Peel the jalapeno pepper and mince it. 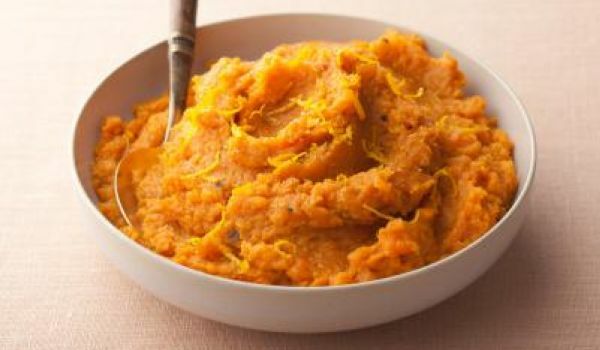 Mix it with sweet potatoes in a large mixing bowl and mash them. Add softened butter, orange juice and cilantro. Process with an electric mixer till smooth and creamy. Add sea salt and black pepper. Mix well. Transfer the mashed mixture into a 1 quart baking dish. Drizzle melted butter over the mashed mixture. Sprinkle the walnut pieces over them. Bake the mixture for about 20 minutes till it is hot in the center.